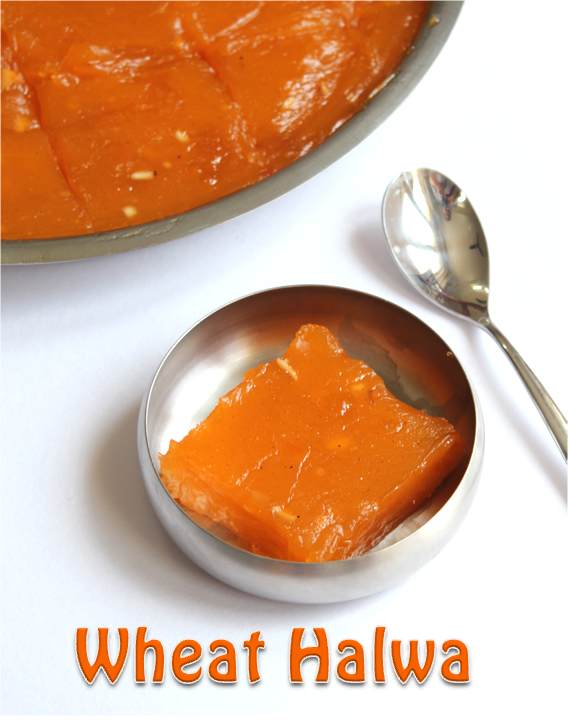 Wheat Halwa is the important sweet during Diwali in my house.My mother used to make this and Diwali Legiyam on the eve of Diwali .She also used to make hot Bajji's to go with the sweet. My aunts used to also make their versions of the Halwa and bring them to my house, thus making the festival and snacks all the more delectable. Coming back to the Halwa it is quite simple except for the fact that it needs continuous stirring. 1.Soak the wheat or broken wheat for atleast 12 hours. 2.Throw the water that it has been soaked in and grind it with some fresh water. 3.Run it through a strainer and collect the milk like liquid. 4.Reapeat this process two more times i.e. extract milk twice. 5.Allow it to rest for some time (about one hour).The thin liquid will be seen on top. 6.Take a thick bottomed pan and pour the thin milk in and then add sugar. Another option is you can throw the thin water and make a sugar syrup with fresh water.If you are using fresh water, just add enough to cover the sugar. 7.Continue heating till you get the string consistency. (when you touch the syrup it should strech from your thumb to index finger like shown in the picture). 8.Add the colour powder mixed with water and the rest of the wheat milk slowly.Keep stirring continously with your right hand while you are pouring with the left. Otherwise it will solidify immediately. 9.Keep stirring till it becomes thick and keep adding Ghee on and off. It takes about 15 to 20 minutes. 10.Take a small portion cool it and roll it in to a ball with your fingers. 11.At this stage, add some Cashewnuts fried in ghee,cardamom powder and edible camphor.Grease a plate with ghee and keep it ready. 12.Pour it on the plate and level it up with a smooth and flat bottomed cup. 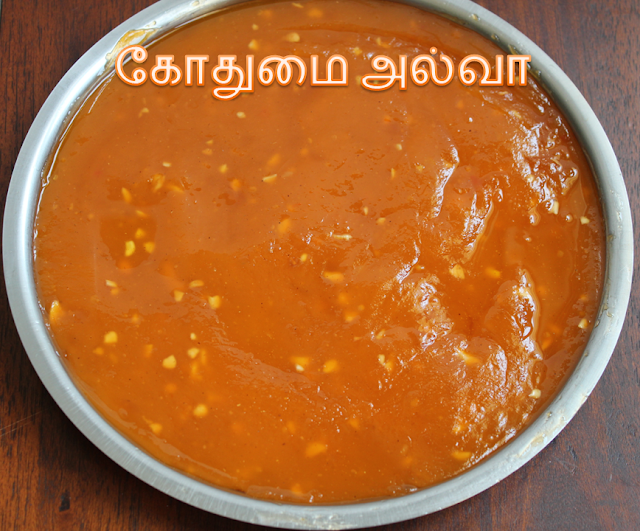 13.Either enjoy it as a halwa when it is hot,or wait for half an hour and cut into pieces. looks very nice uma.. the color texture..wish i could grab one! mouth watering, feel like eating right now. Is there a particular type of wheat to be used? If so what is it called in the Indian stores in the US? Wow! looks delicious and so perfect. Woww.... My amma also prepares like this... looks delicious.. 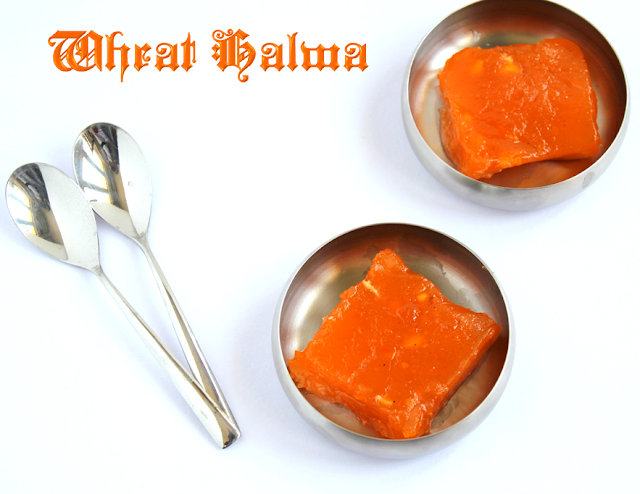 This sweet really looks tempting and feels like a good diwali sweet. I really don know how to use gms to measure wheat and sugar. With US standard cup sizes can i think of wheat to sugar as 1:3 ratio.